The unprecedented roundup has seen more than 200 princes, ministers and businessmen detained in what has widely been seen as a move by Crown Prince Mohammed bin Salman to consolidate his power. 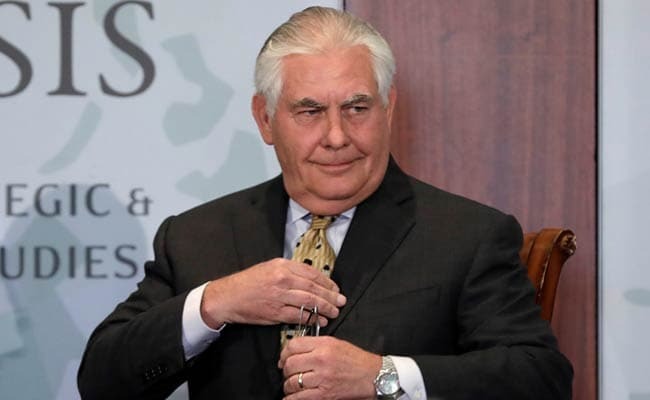 Riyadh: Saudi Arabia's mass purge of elite figures accused of corruption "raises a few concerns", US Secretary of State Rex Tillerson said Friday, as Washington's Gulf ally probes graft allegedly worth $100 billion. The unprecedented roundup has seen more than 200 princes, ministers and businessmen detained in what has widely been seen as a move by Crown Prince Mohammed bin Salman to consolidate his power ahead of his accession to the throne. The domestic upheaval has come as Riyadh is locked in an intensifying proxy war with regional rival Tehran that has triggered a crippling aid blockade of neighbouring Yemen which threatens what the United Nations has warned could be the world's worst famine in decades. Tillerson, who is accompanying President Donald Trump on an Asian tour, said he believed the mass arrests ordered by a new anti-corruption commission headed by Prince Mohammed were "well intended". But he cautioned that the lightning roundup "raises a few concerns until we see more clearly how these particular individuals are dealt with". The top US diplomat's comments marked a step back from the fulsome support offered earlier this week by President Donald Trump, who said he had "great confidence" in what the crown prince and his father King Salman were doing. "Some of those they are harshly treating have been 'milking' their country for years!" Trump had tweeted. The Saudi authorities have frozen the bank accounts of those accused and warned that assets related to the alleged corruption cases will be seized as state property. High-profile figures, including billionaire tycoon Prince Al-Waleed bin Talal, are among those detained. After a failed missile attack against Riyadh airport on Saturday, which was claimed by Iran-backed Houthi rebels in Yemen, the kingdom has accused Tehran of "direct military aggression". Iran vehemently denied the charge that it supplied missiles to the Houthis and warned Saudi Arabia of its "might", prompting fresh acrimony between the regional heavyweights. Following the missile attack, a Saudi-led coalition fighting the rebels in Yemen imposed a blockade on all aid deliveries to rebel-held territory that UN aid chief Mark Lowcock has warned threatens millions of people with famine. The UN Security Council demanded on Wednesday that the blockade be lifted but there was still no response from the coalition as aid deliveries were blocked for a fifth day on Friday. The tensions between Riyadh and Tehran were also playing out in Lebanon where the shock resignation of prime minister Saad Hariri in a weekend announcement from Riyadh has created a destabilising power vacuum. The Sunni leader had been sharing power with the Iran-backed Shiite militant movement Hezbollah in a hard-won national unity government but the arrangement had come under increasing fire from Saudi Arabia, where he holds dual citizenship. French President Emmanuel Macron, whose country was the colonial power in Lebanon, made a surprise visit to Riyadh late on Thursday to discuss the crisis with the Saudi crown prince. Lebanese Foreign Minister Gebran Bassil on Thursday demanded the return of Hariri from the Gulf, while Al-Akhbar newspaper, which is close to Hezbollah, suggested he was being held "hostage". But French Foreign Minister Yves Le Drian said that Hariri appeared to be "free to move around", given that he had travelled to the United Arab Emirates capital Abu Dhabi on Tuesday. "The Lebanese situation is the most worrying subject of the moment," Le Drian said on Friday. Lebanon "was moving towards a new solution with a new constitution, elections to come. The departure of prime minister Hariri creates new uncertainties." Hezbollah leader Hassan Nasrallah, who charged on Sunday that Hariri's resignation had been imposed by Riyadh, was due to give a speech later on Friday.